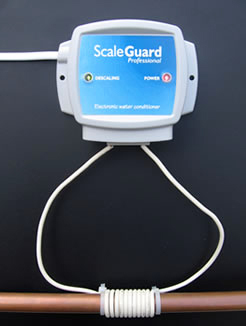 The ScaleGuard Electronic Water Conditioner. Scaleguard is a tried and tested electronic water conditioner guaranteed to control hard water scale, reduce existing scale, reduce maintenance costs and save you energy and money. Just one unit fitted to the incoming main will de-scale and protect the whole house for a running cost of £10 per year. Say good-bye to limescale, scaled up water systems under performing boilers and clogged pipes. ScaleGuard fits most pipe sizes; fitting is simple and straight forward in less than half an hour. Scaleguard saves energy – saves money throughout the year. Controls scale build up on tiles, taps and sinks in bathrooms and kitchens. Boilers, cylinders and all of your washing appliances last longer. Having tried the system out I would say that its performance was very good and would recommend this to other people to try. Very impressed with it … I have tried out three others on the market and yours is by far the best. We were featured in the Mail Online. Click here to read the full article.